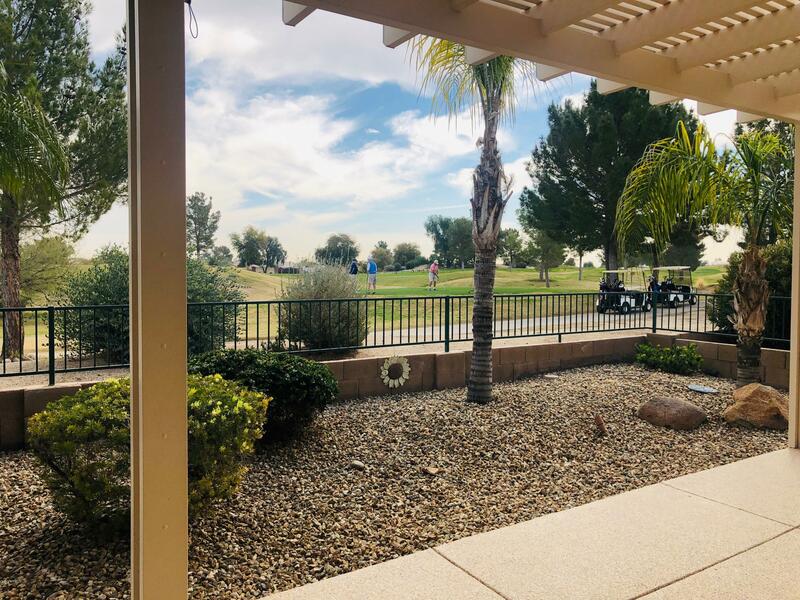 Imagine the possibilty that you could own the most beautiful home in Arizona Traditions with a stunning golf course view! Well, now you can. This stunning Sonoran model home has all the upgrades you can possibly hope for. Two Bedrooms + Den, two baths and a 3-car garage . Great Room features 10' Ceilings, SS Speakers, amazing built-in entertainment center that holds 60'' TV, fan, 4 1/2'' shutters & D/R has 12' slider. Kitchen with x-tall Hickory Cabinets, Granite, R/O, Samsung Fridge that stays, double ovens, soft water loop, walk-in pantry and bay window in eating area.Bathrooms complete with granite, extra tall vanities and commodes, complete tile showers and upgraded light fixtures. 2 masters with fans, cell shades, carpet & tile with a bay window in back master. Solar $49.00 a mo. Hand crank screens on back patio. Gas line to rear of home. Can put a gas stove in. Gutters front and back.Water system in front and back for plants. A/C serviced in 2017, Front of home has Double Security Screen Doors 2008. See list inside home for dates of all updates and furniture that is for sale.